An original 1974 UK Apple/EMI Records promotional poster from the release of John Lennons album Walls And Bridges. 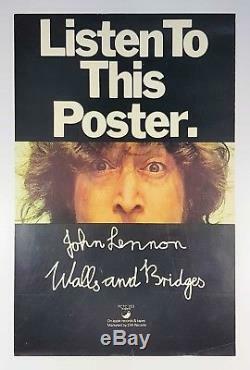 It features a headshot of John Lennon with the words Listen To This Poster above and John Lennon, Walls and Bridges printed below. The poster has been rolled. It measures 51cm x 76cm (20 inches x 30 inches). There is some creasing to the bottom edge and top left corner. The condition is very good. Near mint = Almost like new with one or two very minor flaws. Excellent = Minor wear yet looks attractive and is perfectly usable. Very Good = Some wear and tear but overall presentable and usable. Good = Apparent wear and tear but with obvious deterioration of the condition. A plus or minus after the grading indicates that the condition is marginally higher or lower than the stated grade. The item "Beatles John Lennon 1974 Walls And Bridges Listen To This Apple UK Promo Poster" is in sale since Friday, July 27, 2018. This item is in the category "Music\Music Memorabilia\Artists/ Groups\The Beatles". The seller is "tracksuk" and is located in Chorley. This item can be shipped worldwide.